To help move research at its fastest pace and ease the burden on families, this registry was developed. This registry will centralize a comprehensive database of individuals with Sanfilippo Syndrome – ALL types. It will allow researchers and companies to better understand the progression of the disease and provide a pool of candidates for pending clinical trials in ONE location accessible by MANY researchers and companies. NOT controlled by any one institution or company! Abeona is developing next generation adeno-associated viral (AAV)-based gene therapies for MPS III (Sanfilippo syndrome), which involves a one-time delivery of a normal copy of the defective gene to cells of the central nervous system with the aim of reversing the effects of the genetic errors that cause the disease. After a single dose in Sanfilippo preclinical models, ABO-101 and ABO-102 induced cells in the CNS and peripheral organs to produce the missing enzymes and help repair damage caused to the cells. Preclinical in vivo efficacy studies in Sanfilippo syndrome have demonstrated functional benefits that remain for months after treatment. A single dose of AB0-101 or AB0-102 significantly restored normal cell and organ function, corrected cognitive defects that remained months after drug administration, increased neuromuscular control and increased the lifespan of animals with MPS III over 100% one year after treatment compared to untreated control animals. These results are consistent with studies from several laboratories suggesting AAV treatment could potentially benefit patients with for Sanfilippo Syndrome Type A and B, respectively. In addition, safety studies conducted in animal models of Sanfilippo syndromes have demonstrated that delivery of AB0-101 or AB0-102 are well tolerated with minimal side effects. Biomarin: A Study of Mucopolysaccharidosis Type IIIB (MPS IIIB) > currently recruiting in several countries. 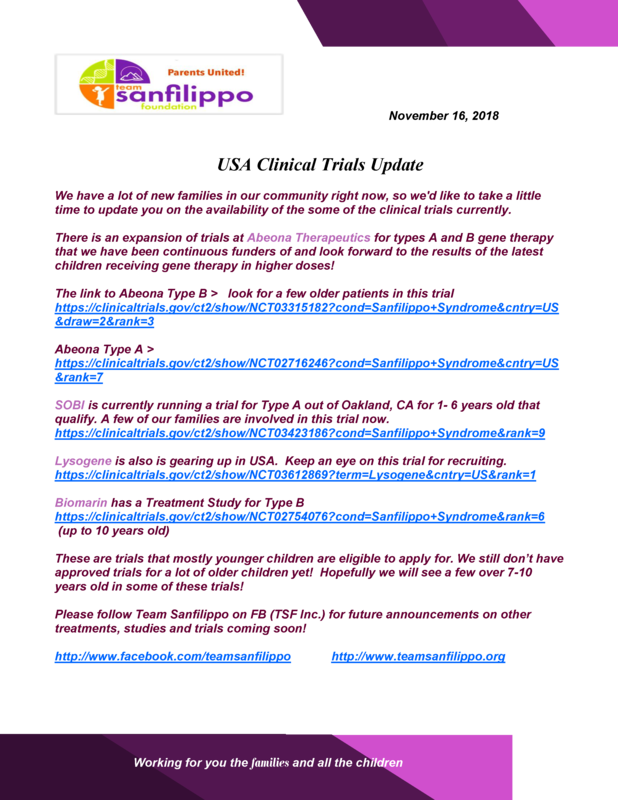 BioMarin has recently started a programme for children with MPS IIIB (Sanfilippo B syndrome). This will involve multiple centres around the world. The program will enrol children between the age of 1 and 10 years who qualify, although the majority of children will be under 6 years old. The program consists of two studies. The first study is an observational study of children with MPSIIIB and includes testing of cognitive and adaptive function, as well as assessments of behaviour and quality of life. This study is intended to provide baseline information to help in determining whether these children subsequently benefit from treatment in the next phase of the programme. This observational study is now open. In the near future, BioMarin plans to start the second study. The second study will be a treatment study in which children will receive an investigational enzyme replacement therapy. This will be provided as an infusion via a port which delivers the enzyme into the brain. This study will be run at the same centres as the observational study. The first phase of this study will enroll a small number of patients in early 2016 to assess safety at several doses. The second phase of this study is targeted to start in mid-2016. In order to enroll in the second phase of the treatment study the child must have completed the observational study or the first part of the treatment study. The intention is to provide treatment to all of the children who have entered into the observational study. Enrolment in this program will be limited to children from countries in which there is a study site. Please visit www.clinicaltrials.gov for more details. Miglustat/Zavesca:Sanfilippo and glycosphingolipids > https://www.researchgate.net/publication/16772059 Abnormalities of glycosphingolipids in mucopolysaccharidosis type III B.
Nuedexta – a prescription used to treat outburst of involuntary laughing or crying in people with certain neurological disorders. As always drugs should be monitored by a licensed physician. This drug has benefited many Sanfilippo children when no other source of pain or reason could be found to cause the weeping and crying continuously. It has only been approved for adults, but many families have been able to get this approved for the child for the past several now. These families have not seen ant notable side effects thus far. Trehalose – is a possible help for reducing GAGs thru autophagy, first article here on autophagy http://www.ncbi.nlm.nih.gov/pubmed/17913701, next article on Trehalose http://www.ncbi.nlm.nih.gov/pubmed/27236019 we have found with several Sanfilippo children that trehalose in the high dosage needed to be effective can result in loose bowels. One way we have found to make trehalose more effective and if done slowly and increased very slowly over time, you can use the substrate reduction therapy Zavesca/ Miglustat 3 hours prior to giving Trehalose. The miglustat is a Trehalase inhibitor and helps to correct the bowels somewhat. The trehalose is not for everyone, but if your child will tolerate it orally, it can be of great benefit. It is OTC and not prescription. Zavesca is a prescription drug and does take authorization to acquire. We are currently trying to set up trial to administer this in a more effective way. Chinese medicine has a lot to offer in balancing and clearing systems to work more appropriately than some drugs we typically use. It’s just a matter of fine tuning them while working with a good Doctor of Chinese medicine to assist in the process. Things such as liver and spleen issues, pancreatic function and more can be helped thru traditional Chinese medicine. **We have provided all information on our website for educational purposes only. Medical information obtained from our website is not intended as a substitute for professional care and should not be considered as such. You should consult a healthcare provider before making adjustments to your healthcare, lifestyle and/or diet. Also, do not remove yourself from any of your prescribed medications or treatments without consulting your physician. As with all medical treatments, treatment responses can vary from patient to patient, even if the diagnosis is similar.